part by itself, abstracting the rest of the system, e.g. "i = i + 1" understood as a unit means nothing more than "increment i by one". Integral Understanding would require us to see how that sentences interacts witht the rest of the code, so for example that sentence could "move a loop forward". "How", "What", "Why" are three questions that are also helpful to see different facets of a system. A lot of what follows in this article might seem obvious to seasoned developers, but in my experience, these dimensions, because they're intuitive, are often not adecuately explained to junior developers. that collaborate between each other to produce a result. We don't care what the result is or why do we want that result. "Does it use POST roundtrips or AJAX requests?" "how does it keep state? mongo? sql? cookies?" So "How" (and also "what" and "why") is a guiding question we use to both understand existing system and to build new systems. And the starting point of the "how" is the result we want to achieve, so "how" is actually the last question we ask, since it's preceded by "what". a POST goes to the server, increases the record in the database...", but that's what I called the "how". "Well, the system has two buttons, and a cow count display, when the buttons are clicked, the cow count is increased or decreased." But this description is lacking: where is the human? What is not only "what the computer system does?" but "what the human does with the system and outside the system?" of the corral hitting the minus button everytime a cow goes out to eat grass, and the plus button everytime a cow goes in. through time with the state of things changing as a result of it. goes looking for the unruly cow. And the user also INTERPRETS the computer and INTERPRETS the world outside the computer. All four things are linked. (Interpreting the world) User notices enough time has passed, must now ensure all cows are in the corral. (Acting on the world) Go look for any missing cows. The external world is then "linked" to the computer system, allowing the user to interpret the world according to what they read on the screen. The user by reading the count on the screen takes that as a symbol of the actual amount of cows in the corral. the cows in their head, and another asking this person how many cows are in the corral and hearing back the answer. equals the number I'm reading, and the internal state of the system equals the amount of cows in the corral". with each other and interpreting what each other says, both interpreting symbollicaly each other, the human reads a plus sign and goes "I guess that increments the counter"
and the computer when it receives a click it goes "the user wanted to increment the counter, store updated data and refresh display". Each user will interpret what they read from the world and the computer, each symbol, according to their previous knowledge (i..e representation) of the world. and not understand a damn thing of what you meant to convey. Because every user has lived different lives, thought different things, and will interpret differently the symbols you're presenting to them. e.g. plus means not only "adding one" but also "cow went back into the corral". interpret unless they cultivate this skill. how many cows do they have, regardless of whether they're inside the corral or not. different movie watchers might watch a different "story" when watching the same film (one might say it sucked, another might say it rocked). And you need to think your target users: a sleek interface might be mysterious to less proeficient users, a more explicit interface might look clunky to more proeficient ones. it conflicted with my expectation. It might even conflict with my will ("I want the user really deleted! I don't care if they cannot login anymore!"). I need to know why. If "how" was the realm of computers, "what" was the realm of human-computer interaction, "why" is the realm of the physical world, ideas, and will. Those three things are what actually gives form to software. 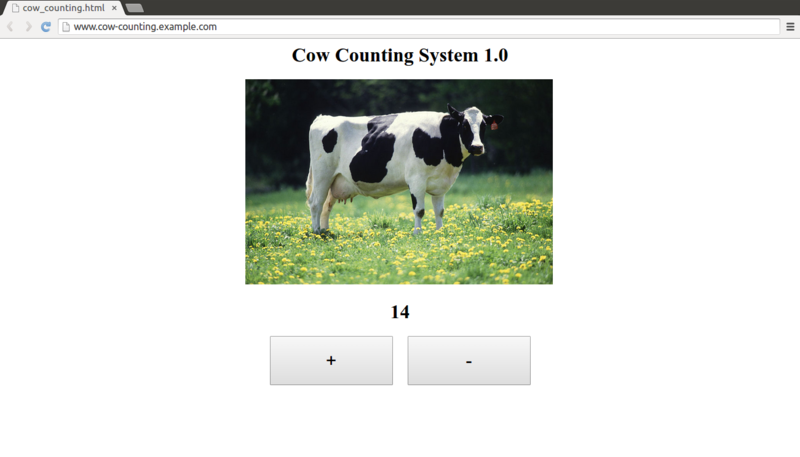 Back to our example: what drives "what" the Cow Counting System does? and why we built it that way, with a display of the current count of cows and two buttons? of cows getting in and out. ideal-symbolic system that's shared and enables communication. and a lost cow means a loss of profit. All these work like "invisible forces" that we intuitively graps and shape computer systems as much as pointers and loops. of mistakes that might lead to a loss of profit (symbolic reactions to the green and red colour is also a force we know applies here). unique, but as so far as this system is concerned, they're an undifferentiated set. relations, how state changes through time, and the processes the user has interacting with these entities. So for this case, the domain would be cows, how many there are, which state they can be in (outside/inside the corral), and the act of counting and controlling them. but the supermarket owner, and very different goals mean different forces are at play. History of what has happened: Being able to see what happened for debugging purposes, being able to blame a particular employee for missing cash, mining data, etc. the first name and last name are switched and you have no quick way of undoing the operation... people can and will make mistakes. We need to be aware as well that there are many actors in a system that relate differently in each case. someone is on vacation to break into their houses. Advertisers, administrators, data miners, owners of the app, developers, devops, all have their sides and interests. want it when it helps us avoid undesirable situations. Conclusion... or something like it: Why should I care? how should I take this into acount? division of labor, some people focus more on the "whys" and "whats" and others more on the "how". and it might be annoying for the user, and if many cows are going out at the same time, end up being problematic. You'll see that "how" you build the system and the "whys", the external forces and entities, if they're in harmony or not, matters a lot when new requirements come in. logging into the system, and the email for logging in might be different from the email you wanted email notifications to be sent to. system works, but what it does, and how it relates to people and what do those people want from the system. symbolic links we're reading and giving away. on how the interfaces we build communicate and help the user build a story. activity of programming relies heavily on the programmer building useful internal theory of the system. concepts the system exposes to your users and how that impacts on the user experience. because it talks precisely about the symbolic thought and links that the developer makes when reading code, and the security pitfalls that come associated with it. It also reveals why computer systems security is so hard.